The experienced auto technicians at H&H Mobil can quickly and easily test your car battery and provide you with an affordable car battery replacement as needed. Located conveniently in East Lansing at the Corner of Haslett Rd and Hagadorn, we make it easy to stop in (or get a tow, if necessary) and replace your car battery. Our car battery replacement process is quick and affordable, so you don’t have to readjust your schedule to make sure your battery is in top shape. Request Appointment or call us. The H&H Mobil auto repair team will test your battery to verify the need for a car battery replacement and ensure other systems have not been affected. Next, we can assess any problems you’ve experienced, such as a slow start, malfunctioning electronics, a warning light, or a non-start. After this assessment, we can find the best car battery replacement for you and make suggestions about any other affected systems. With this brief check completed, we can finish the battery replacement and you can be on your way again. Wondering if you need a car battery replacement? There are a few key warning signs. If a vehicle gets especially cold, if electronics or headlights have drained the battery, or the battery has simply run out of power, the battery will not supply enough electricity to start the car and a battery replacement will be required. If the engine clicks but doesn’t start, you are likely to need a replacement battery as well. H&H Mobil offers towing services to our East Lansing repair shop if you cannot start your vehicle. 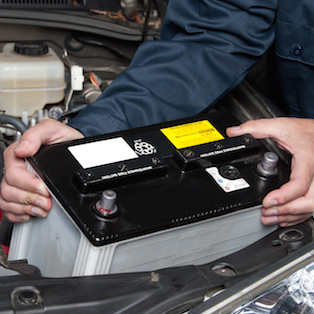 In general, a car battery should be replaced every four to five years. The best way to prevent a dead battery is to get a car battery replacement before the useful life expires. Not ready to schedule a brake repair, but have a question? Fill out our brief car diagnostic report and get your brake repair questions answered by our East Lansing brake repair experts at H&H Mobil.